Lowering a light fixture has never been easy without a light lift system. Light fixture lifts are used for lowering lights for ramping or cleaning and then raising them back to their normal position. They are among the most elegant raising and lowering equipment systems in the lighting world. A light lift or a motorized light fixture lift system is very important when installing lights or chandeliers on a high ceiling. They are used for lowering and raising indoor and outdoor lighting fixtures as well. A standard requires at least three feet of vertical access with the ceiling. A remote mount LL allows for placement of a motorized winch away from the chandelier by the use of a pulley system. Today, lighting hoist systems are used in various locations such as theatres, stage light bars, hanging artwork in art galleries and menu board lighting. They have also been adopted in churches and other places of worship that have extremely high lighting heights. Retail shoppers uses light lowering systems for hanging advertising materials as well. Installing light lifts or chandelier hoist systems enables you to maintain the beauty of your room by easily maintaining your chandelier lamp fixtures. Despite your height, you can clean or change bulbs with ease. With motorized light fixture lift systems, even your child can do bulb cleaning and replacement anytime. Pulley system light fixtures are the perfect replacement of dangerous ladders which were initially used for reaching chandeliers. Nowadays, you can easily lower the bulbs and perform maintenance services without necessarily seeking the help of expensive cleaning service providers. 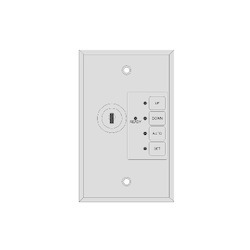 Chandelier lifts offer remote mounting options that can easily be built on a light lift. They consist of unique cable systems, pulleys and brackets. 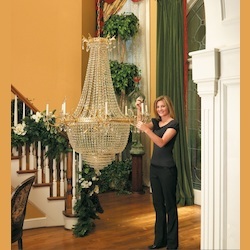 Remote mounting options are necessary when there is no direct access above the chandelier. Some chandelier light lifts are fitted with two independent locking systems for holding the chandelier securely. 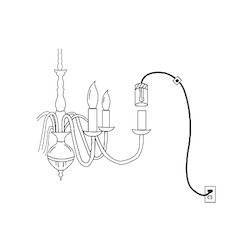 To ensure maximum security, the electrical current is usually disconnected as soon as the chandelier starts being lowered. This ensures that there are no risks of suffering electrical shock while you are cleaning the lamps. Together with the canopy and the chain, the chandelier lowers at relatively low speed to avoid any accidents that can occur. You can adjust the cable length to allow the chandelier lowers enough for easy changing and cleaning of the light fixtures. However, you should not adjust the cable to an extent that the light fixture hits the floor. 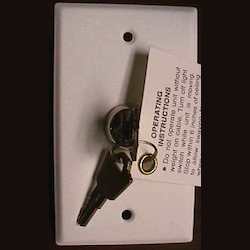 After you are done with the cleaning or changing of the lights, you need to turn the key switch in the other direction to raise the chandelier back to its original position after which the electric power is restored. 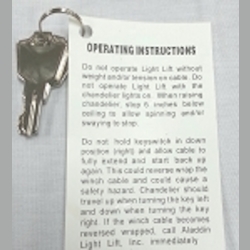 Reduce your chandelier maintenance cost by ordering a quality light lowering system from We Got Lites. 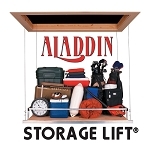 We are a one stop destination for all types of light lift fixtures and accessories, including light lift chandelier hoist, light lowering systems, pulley system light fixtures and others. Contact us today for high-end Wilshire light lift fixtures at great discounts.